This is a public service announcement. 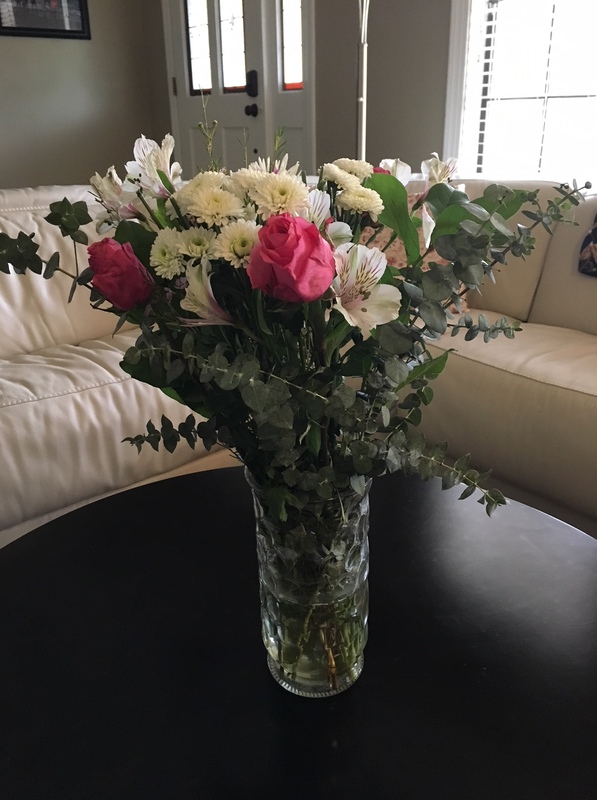 If you’ve been caught up in the post-holiday clean-up or the crazy cold weather that has invaded the country, then allow me to put you on notice that Valentine’s Day is just around the corner. To be exact, 22 days as of this posting. As I ponder the sign at the corner Walgreens, I realize it is more important than ever to plan ahead for this day of unleashed romance. This is a night when restaurants set up extra tables and there are long lines at the grocery store as men pick up handfuls of flowers as they head home from work. The card aisles in the stores get picked over so badly that if you are pale like our family, you may have to show the DNA results from Ancestry.com to explain the Mahogany brand being chosen as the best of the remaining three cards. Sidebar: Yes, I have received the Mahogany brand before, and while the verse was very nice it was unusual to have white-as-white Bob and I being portrayed by a couple of a different race – not that there’s anything wrong with that. Our kids called their dad out on being a last-minute shopper, while Bob said he didn’t know what they were talking about. For the record, I’m sure both sides were telling the truth. But I’m not hear to warn you about card choices, though I will say it was long overdue for the card industry to recognize that it’s a colorful world out there. I’m here to join with Walgreens and encourage you to get a flu shot or do something equally special for Valentine’s Day like Lysol down the house. Do you know how many germ-infested people have used their disgustingly dirty hands to look through those cards? Some have probably flipped through them while awaiting their prescription for strep, flu, or bubonic plague, while sneezing. And the close quarters at restaurants are a veritable petri dish of influenza. That’s not the kind of culture you’re looking for on Valentine’s Day, that’s for sure. Thanks, Walgreens! You truly are a caring organization. 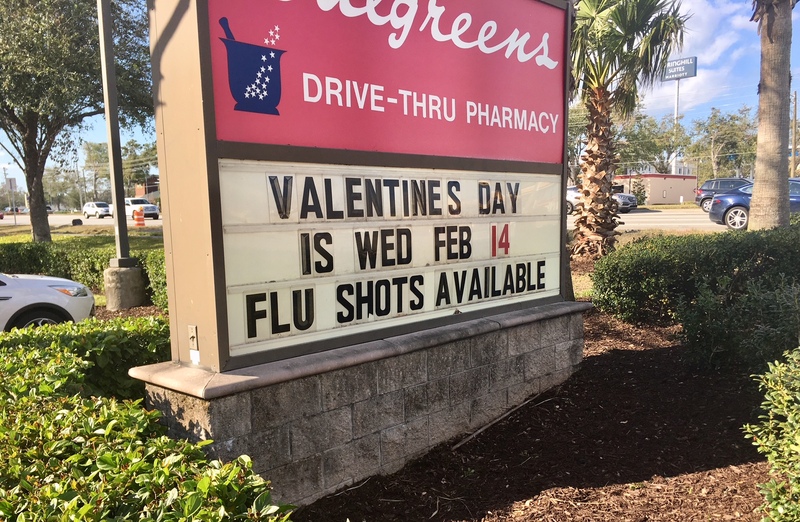 In case you’ve been under a rock somewhere, let me inform you that the flu shot takes two weeks to gain efficacy in your body, so you still have a few days to ensure a very special Valentine’s Day. If you’re not an immunizer, you may want to stay under that rock for a few more weeks until flu season passes. Or you could do what Walgreens is really promoting, plan on getting those shots together for Valentine’s Day. Now that’s love! We ate dinner in a crowded restaurant at a folding table. We couldn’t hear each other talk. Somebody backed into our car. We were cussed out by Adele. Not the worst Valentine’s Day we ever had! Next year I think we’ll stay home, order pizza and watch a movie. Maybe by then Identity Thief will be on TBS. I remember when my kids were young what a pain in the neck Valentine’s Day was – all those cards, all that candy! It was worse than Halloween or Easter because you added to it the notion of romantic love, which really should not be pushed on any seven-year old. I always preferred to introduce that concept to my kids when they were well into their twenties. And, speaking of seven-year-olds, our granddaughter Ella has been preparing her Valentine cards. She is a very loving little girl and made sure not to forget anyone. She went down her list – parents, sisters, her brother Jett, Jett’s imaginary friend. Yes, she included them all. Jett is four. He is badly outnumbered in his house by his three sisters. Thankfully, he has a very special, though imaginary, friend who is a boy. Jett’s friend is a bit different from most of the imaginary friends that I have heard about. Jett’s friend is a blankee; actually he’s more of a persona. His name is Green Wee. We don’t know why. Green Wee, or GW for short, is so life-like to Jett that he talks about him as if he were real. He told me one day that Green Wee had his cousin visiting him. Jett was happy for him to have company and wasn’t threatened at all by another imaginary friend in the life of GW. Sometimes GW disappears. (I guess we all need some alone time.) When that happens the entire household is enlisted on a search and rescue. Usually he hasn’t gone too far (after all, he is a blanket). GW closes himself in the bathroom cabinet when he has to “go.” I suppose his waste is akin to lint – he never puddles on the floor. Bedtime, of course, is when GW is most needed, and he is the only one that can make Jett feel better if he gets a boo-boo. He is one compassionate blankee so I think it is entirely appropriate that Ella sent him a Valentine. 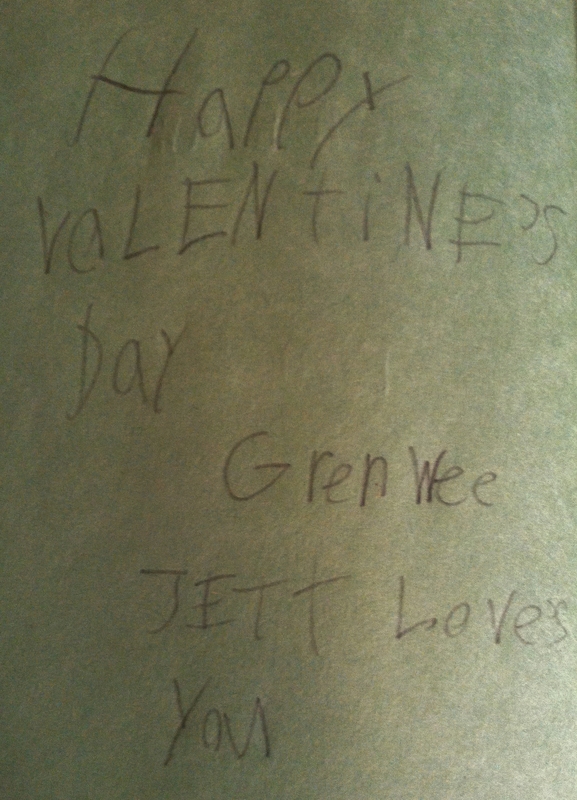 It is extra special when you notice that she took the time to make sure that Green Wee knows that Jett loves him. When I look at Green Wee, I see a well-used blanket or lint in the dryer. In Jett’s imagination he sees a friend. This challenges me to make sure that I’m not treating my loved ones like dryer lint. And I especially don’t want to be a wet blanket to them.